Trainee P.C. Arthur Bradshaw during his first visit to Bottesford in 1929. 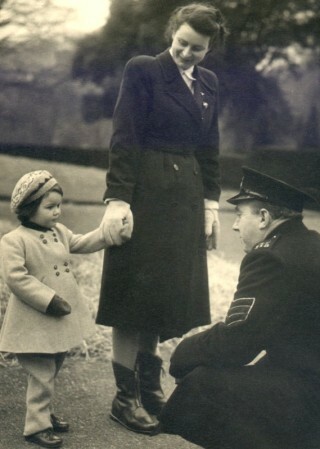 Lady Charlotte meets the Sergeant, 1950. Mrs Vera Bradshaw, in the police station garden at Bottesford, 1950. 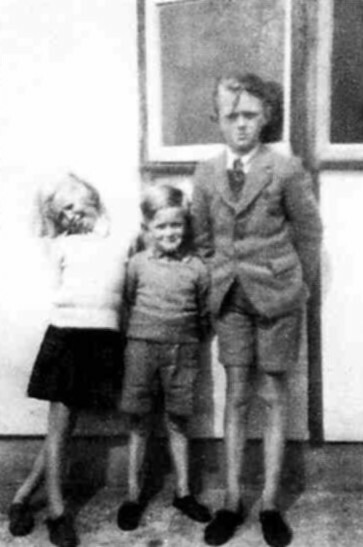 The Bradshaw children on holiday at Happisburgh, Norfolk, in 1948: Angela, Michael and John. 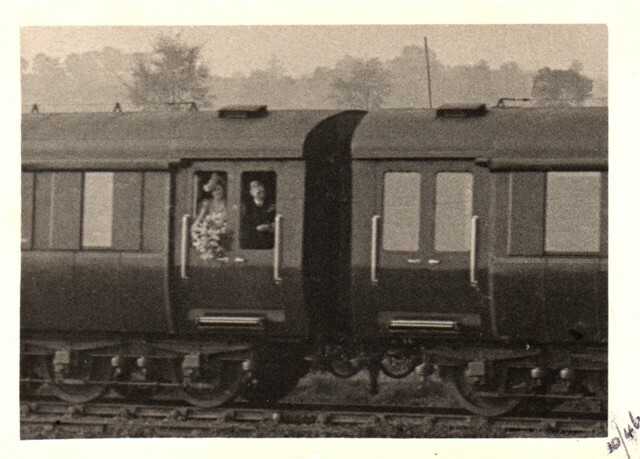 King George VI and Queen Elizabeth aboard the Royal Train, 1946. 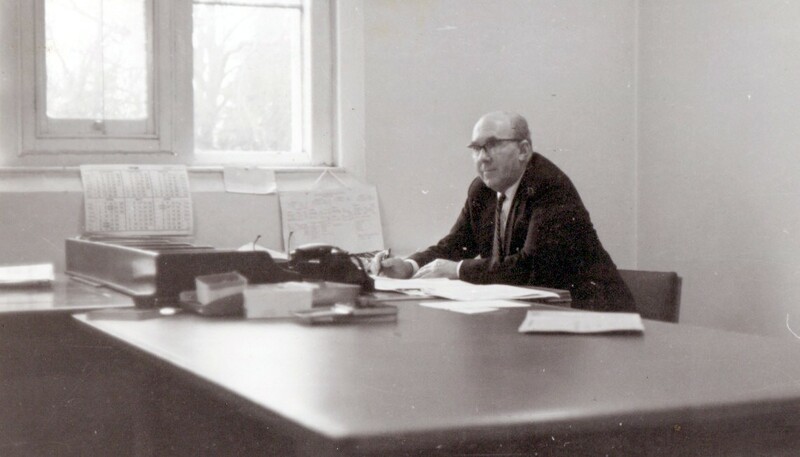 Retired from the police force, behind the desk at St Vincents Dept of Works, Grantham, 1969. 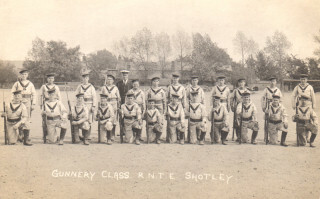 Arthur Bradshaw at gunnery school, Shotley, 1921 (Front row, 5th from left). Aboard Barham, Gibralta, Jan 1924 - A. Bradshaw second from left. 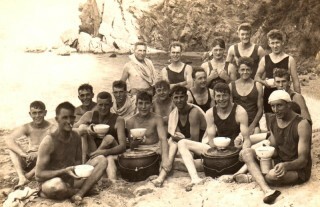 Arthur and mates taking a break at Gibralta, 1922-1924: Arthur Bradshaw at R of second row. 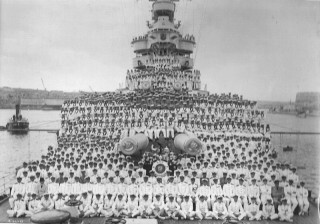 The Barham ship's crew - see if you can find him!!! 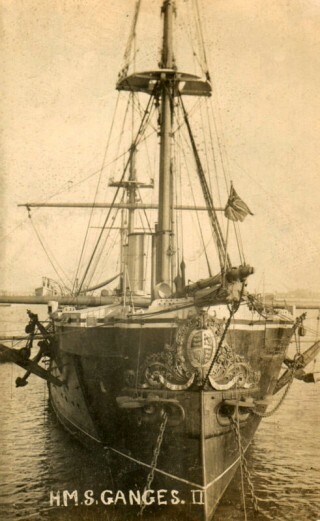 HMS Ganges training ship, 1921. 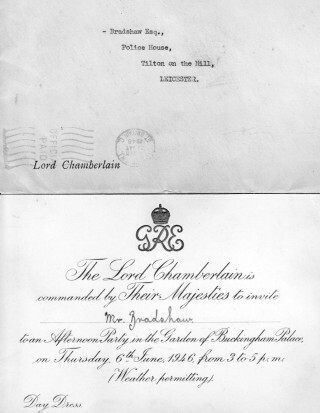 Invitation to the Palace, 1946. 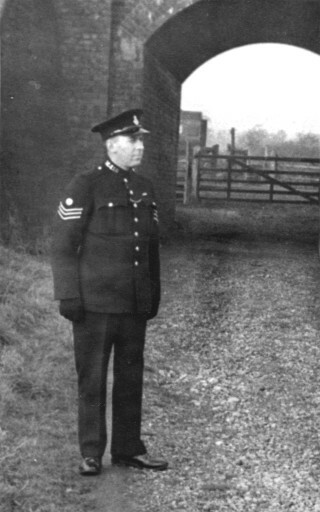 My father, Police Sergeant Arthur Bradshaw, came back to Bottesford in 1948 from Tilton-on-the-Hill. The picture shows him on guard duty during a visit by King George VI and Queen Elizabeth aboard the Royal Train in 1946. Previously Royal Navy as Able Seaman 6 yrs service. Retired May 1953 Aged 47. Length of service 25yrs & 100days. Pension 272 pounds 11 shillings per annum. 31/341 Large scale illegal slaughtering of sheep. 26/11/1929 Knocked down whilst on point duty. 27/6/1931 Hit in face with cricket ball. 15/3/1941 Broken bone in hand, caught in door whilst removing a drunk from dance at Drayton. 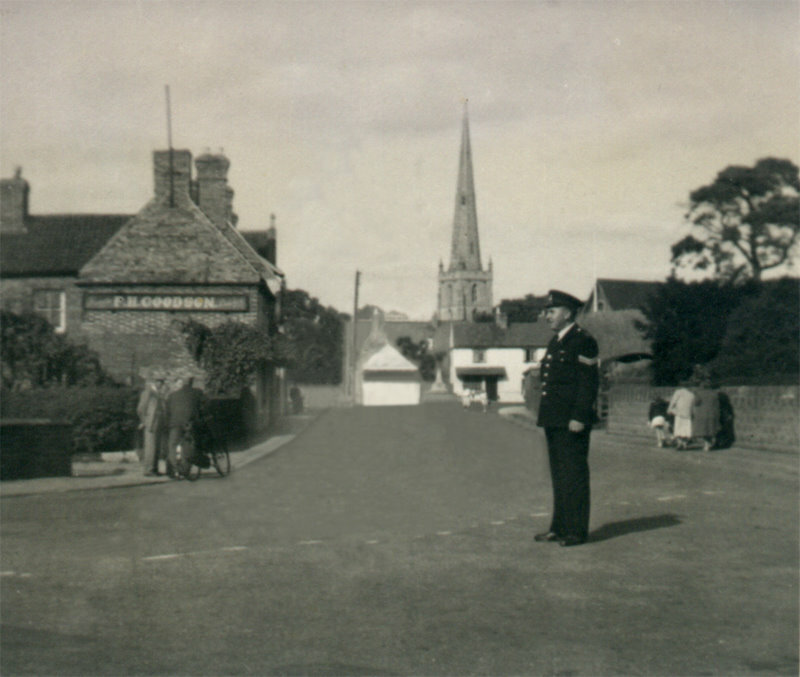 After living in a small village like Tilton-on-the-Hill through the War, I remember how much bigger Bottesford was. I was nearly six at the time. With my brother John and sister Angela, both older than, I fitted into our new environment very quickly, as I described in my story, Recollections of Post War Bottesford. Obviously my father, on his promotion to sergeant, had gained a lot more responsibility, his new area being a lot larger than the previous posting, with Police constables under his control based in different villages through the Vale of Belvoir including Croxton Kerrial, Harby and Redmile as well as Bottesford, and this was all governed by the HQ in Melton Mowbray, his Superintendant at the time being Mr Moore. The main duties were general law and order requirements i.e. issuing and serving of summonses, appearing in court, issuing licences for firearms, control of stock on farms when anthrax and foot and mouth were declared by the Ministry of Agriculture (this was to stop animals being transported from infected areas and hopefully stopping the spread of virulent diseases). Last but by no means least was controlling late night drinkers in the Hotels and Inns in the Vale, not appreciated by the average drinkers or hoteliers in the community, but my father used to say “Give them an inch, and they will take a mile”. Melton Market was also a weekly visit, and of course to attend HQ. 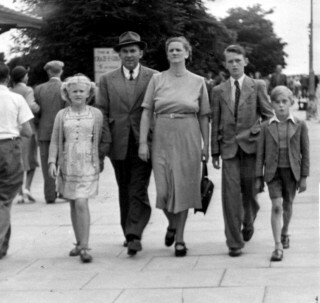 This was a day in town for Mother and us, when we were not at school, though usually she had to man the Office which was attached to the Police Station in Queen St. She often said if she had been paid for her services she would have been a rich lady, but this was and possibly still is the lot of the Policeman’s wife. 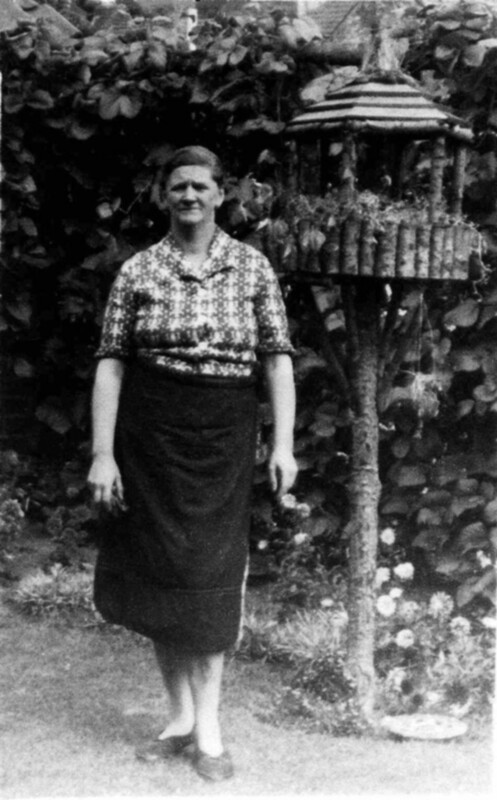 She was much appreciated by a lot of village people, for her kind and helpful disposition, and her ability to be able to make and alter dresses, jackets, shirts and all things apparel. She quite often was the first person at the front line if my father was on duty: she had to handle good, and often some bad situations in her stride. The main duties looking back I think included protecting and looking after the interest of The Duke of Rutland’s Estate, and all its valuable assets, not only in the Castle but in the stock, game and properties, throughout the Vale. I can remember on so many occasion large amounts of netting, snares, firearms and also pheasants, partridges, hare and rabbits trapped by poachers. Quite often, some of the perishables were given by His Grace as a small thank you, and I can remember that very nice taste of fresh game on quite a few occasions. The villains that were apprehended had to attend at the Court House at Belvoir or at Melton Mowbray. The Old Court House at Belvoir is still there, though no longer in use, on the other side of the main entrance to the Castle next to the Dowager Duchess’ home. I can also remember going to the Castle on week-ends and often looking inside the old Court House. At this time the road to Woolsthorpe was gated, so my father would leave me at the gate while he went about his duty. This was always a way for me to make some useful pocket money, but the only problem was that local boys soon also found out how easy it was to earn a few shillings, so quite often we would have to share the tips. My father had to liaise with the many Gamekeepers in the area, and because of this I got to see parts of the Castle and grounds that even today the general public are not aware of. Another event I remember was on Saturday night being allowed to sit in the vehicle which was the first in the Leicestershire Constabulary fitted with two way radio, and if a call came through I had to quickly call my father away from his supper. I still remember the call sign, it was MTNL 25. During the time just after the war there were a lot of vagrants in the district, possibly due to the Duke’s Pantry as my father used to call it. My mother quite often gave poor unfortunate travellers a meal, in exchange for some menial task around the garden. Unfortunately the churches around the district were easy pickings for the lead they had on their roofs, and at this time after the War scrap lead and copper were at a premium with high prices being paid. I suppose being the son of a Police officer in a rural community in post-war England gave me and my brother and sister a very privileged upbringing. We had come through the horrors of another World War and all the deprivation that those terrible times brought, and because of this I look back to that era being a very happy time, and for that I have always counted my blessings, though many were in poor circumstances! I suppose we were also very lucky because of always having a car, as holidays each year were taken usually on the east coast, from as far away as Redcar, Robin Hood’s Bay, Ingoldmells, the Norfolk Broads and Yarmouth: this happened for a week every year. Mother and Father would quite often also have a week on their own. At this time my mother’s mother, Nanna Pitts, was in residence at Queen St, and one of the PCs looked after the office. The down side of being the Bobbie’s son was that I was top of the list as prime suspect for anything that was pinched from orchards, things missing, and properties damaged or stolen, and some times he was right, but it could not be proved. Lucky for me I didn’t get caught. One thing my father was very passionate about as far back as 1948 was the lobbying the local authorities in respect of changing the condition of the A52, mainly with regard to the straightening of the bends at Muston. A by-pass was mooted even then. 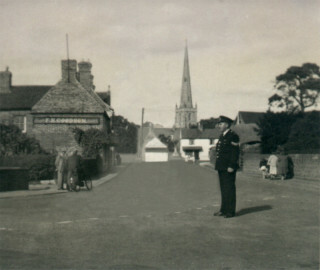 During his service at Bottesford he was constantly having to deal with accidents on this notorious stretch of road, and very often with loss of lives and property. So when some 20 plus years later it did finally come to fruition, if not a little too late, it reminded me of all the work my father had done. 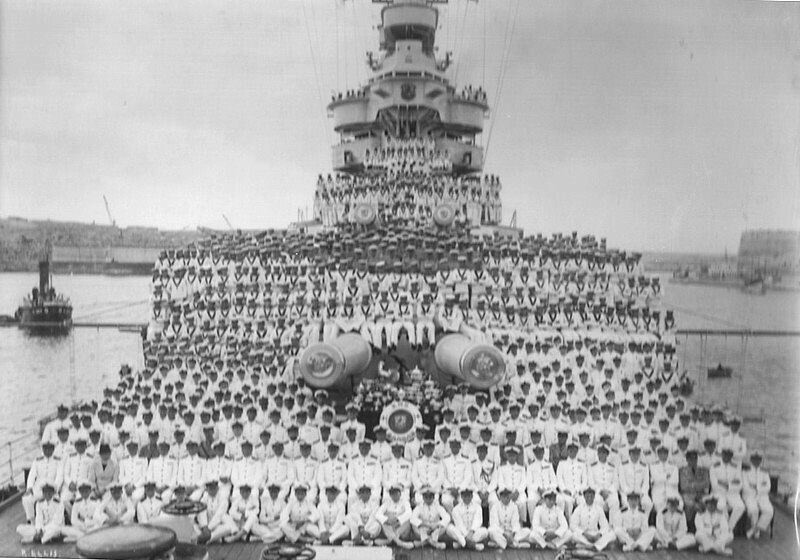 My Father’s strict upbringing carried through to his late teenage years and it was then he joined the Royal Navy. 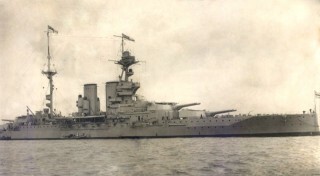 After training in Shotley in 1921, he joined HMS Barham, a Queen Elizabeth Class Battleship launched in 1914. While in service he saw quite a lot of Europe and the Mediterranean. He left the Navy in 1924, apparently following a motor cycle accident while on shore leave. In this he was perhaps fortunate. 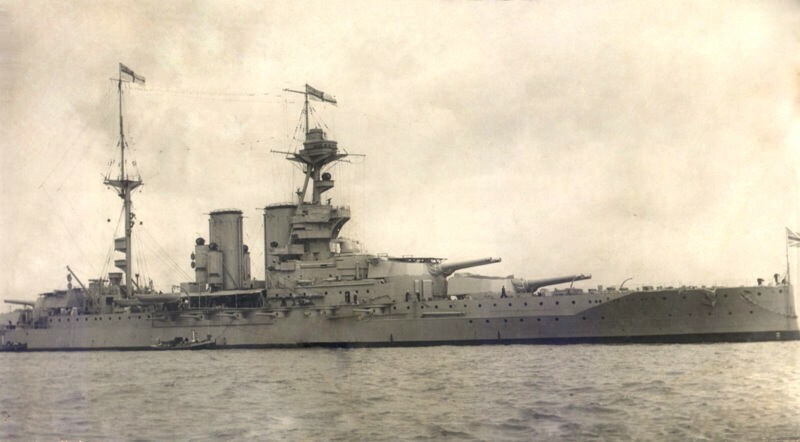 HMS Barham was torpedoed and sunk in the Mediterranean on November 25th, 1941, with a loss of 859 Officers and Men. 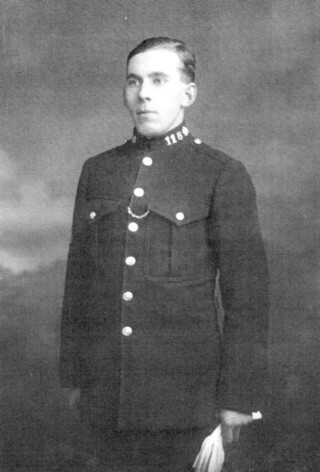 He joined the Police in 1929, and was stationed at Bottesford for a while. The strict and regimented early taste of the Navy, and then the Police Force, all added to an organised but a very fair and well respected Police Sergeant, and a loving father. And obviously I had to except much of the same, at that time it was not very much liked, and we only realised what a wonderful start to life we had all had much later on. He retired from the Police Force in 1953, and changed his career path to office administration, at the Grass Drying plant at Belvoir for a short time, and then a position at Langar working for the Royal Canadian Air Force. That came to an end when the Canadians closed it down. He then finished his career with the Department of Works in Contracts at Grantham. 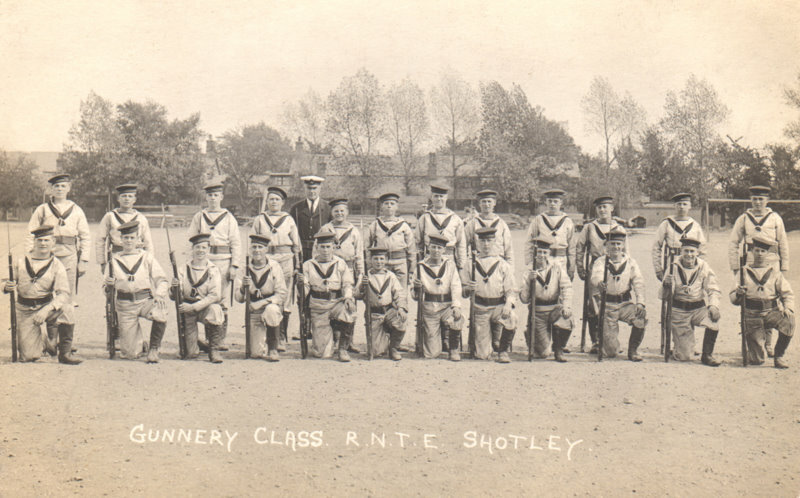 During this time he followed his love of Bowling, and was a champion on the greens at Bottesford Bowling Club on several occasions. 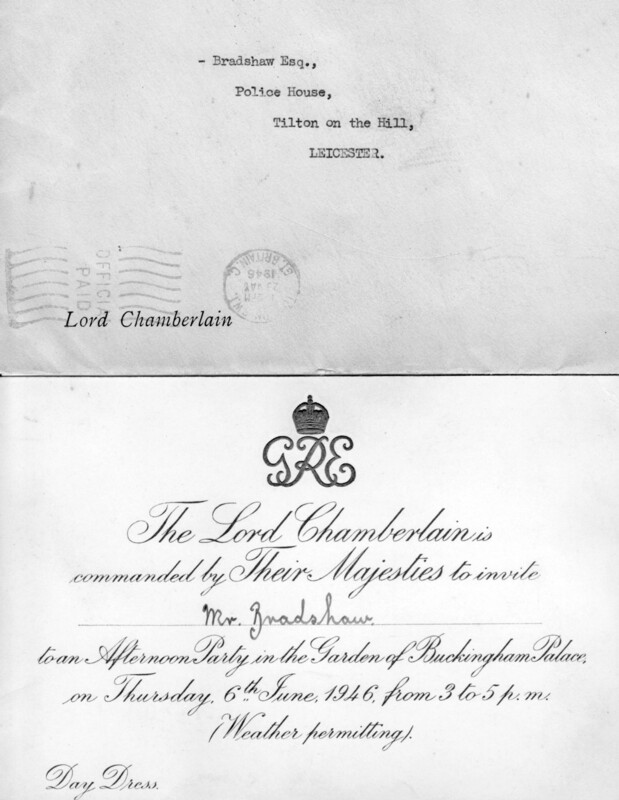 Prior to retirement he helped in the Coronation Celebrations in 1953 during which he was involved with councillor Keel in organising a sports day supported by the Parish Council. All the children in the village participated, and every child received a Coronation Cup and Saucer to remind them of the memorable day. He died in January 1970. This page was added on 28/01/2011. What a lovely piece of writing to read and so nice to see the photos, especially seeing Nanny Bradshaw. We used to run through her garden to go into the back playing field when we were children. Hi, do you have any more photographs taken in or around St Vincents House please? To Graham Evans, no it must have been a different A. Bradshaw as he wasnt born until November 1905. in 1925-6 he was in the mediterranean with the Royal Navy.